When we refer to fast food we are talking about food that is mass produced with little regard to the impact the production has on animals, the environment, and even the workers who are part of the production chain. The trademarks for unhealthy fast food include products with a lot of salt, sugar, corn syrup, and fat. Additionally, fast food typically is laced with artificial flavors and coloring, as well as chemical preservatives and additives to make sure that the food consistently tastes the same. 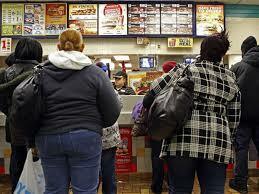 Although the trend has changed somewhat, many fast food restaurants deep fry their foods in unhealthy trans-fats. Often these foods are dispensed through drive-thrus. Fast food restaurants target children, enticing them with free toys, or they have play areas designed to attract kids. A new, emerging type of restaurant is Quick Service or Fast Casual. If you are taking the Fast Food Free Pledge or just trying to eat in a more healthy, sustainable manner, get more information and ideas here – Quick Service or Restaurant Guides.